Sadly, despite a deluge of phone-calls and emails from all of you, the Supervisors did pass the ROSE Policy 4.2 which will extend the same thinking to all open areas. The Biodiversity Plan is intended to document all the areas in the city where native vegetation could grow – and hopes to extend the Plan to all those areas. 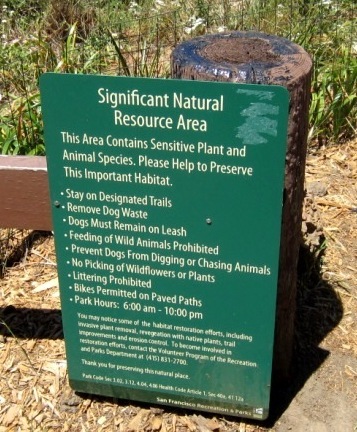 Recently, it seems that San Francisco Recreation and Parks found money to pay for a whole host of new restrictive signs. They’re even worse than the old ones. 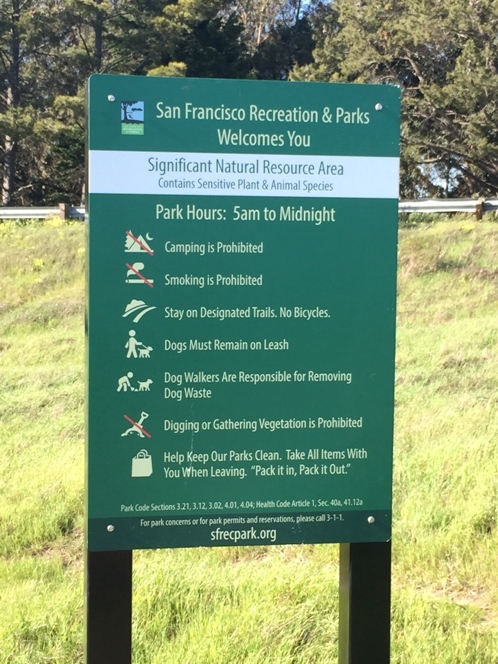 We’ve heard the most complaints from McLaren Park, where besides restricting people to trails, they have prohibited bicycles and tree climbing. Go off the trails. If your kids want to explore or run around, or you want to picnic on the ground – better not go to a park. Ride your bicycle. There’s a flat prohibition: “No Bicycles.” If you were one of the bike-rider volunteers who thought you were building trails that you and your family could use – nope. Off leash dogs. Doesn’t matter if they’re well-behaved or that dogs need a place to run around. Not here. Climb trees. If your kid wants to clamber up a tree that looks made for climbing – well, we have climbing structures for that. Tie a swing on a tree. “Affixing items to trees is prohibited.” The only tree-swing SFRPD is okay with is on their logo. We’re sympathetic with the bike-riders who put in all those volunteer hours and now have been evicted from the trails. But we’re even more concerned about the kids (who may also be bike-riders). Most kids don’t like hiking along a trail and just looking at stuff. 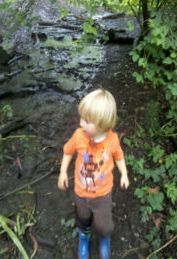 If we want them to enjoy the outdoors and care about the parks, they need to explore. How many of us got hooked on nature climbing trees, chasing butterflies, wading in ponds or streams or puddles, picking flowers, throwing rocks into streams, feeding ducks and other birds, building forts, tying swings to trees? 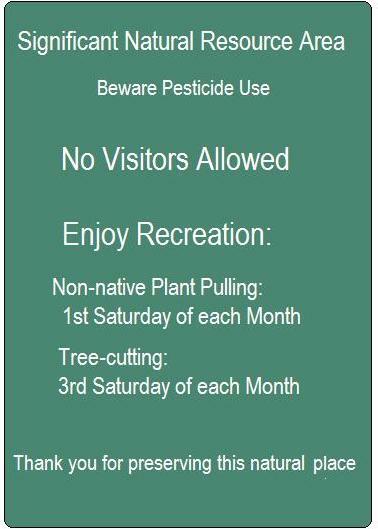 All these activities are prohibited. Those little screens everyone complains kids are hooked on these days? They have one major advantage over our parks – you can interact with them. If you have a car and can drive out to actual wild lands – or if you’re lucky enough to have a backyard with a tree the kids can climb, and can put out a bird-feeder at home – you can provide your kids with some of these experiences. If you live in an apartment, these parks are your backyard. And you can’t do any of these things. They’re not allowed. And this tree has been cut down. You can’t say, “Let’s go to Stow Lake and feed the ducks” – that’s prohibited. You can say, “Let’s go to Stow Lake and look at the ducks” but first, that’s a lot less appealing to a child, and second, once feeding stops, all you see are not-very-many birds swimming along at a distance. In some cultures, feeding ducks and fish and turtles has a significance beyond just bonding with animals… but too bad. There are thousands of kids in our city who are learning that parks are mostly about not being allowed to do anything interesting. Thank you for this excellent post about the escalation of the war on recreation in San Francisco’s parks. 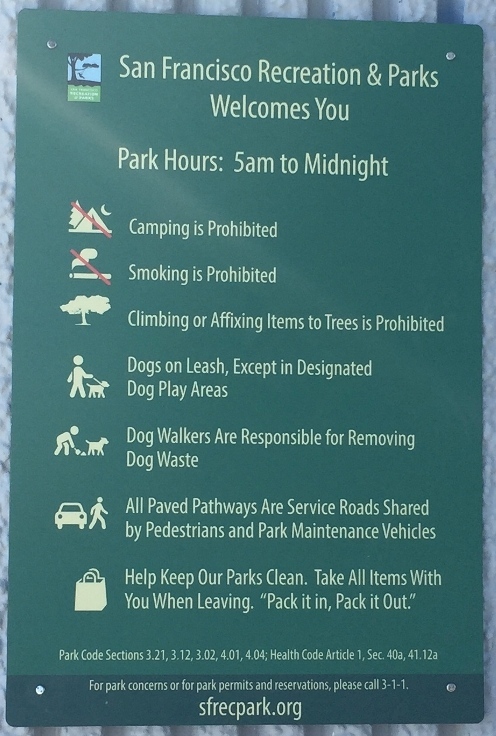 Your final sign mock up is an accurate paraphrase of the policies and practices of SF’s parks dept. 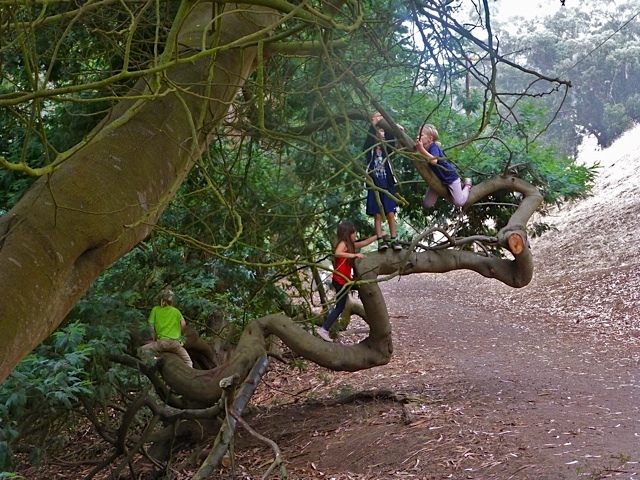 SF’s Rec & Park Commission recently endorsed the “Children’s Bill of Rights.” One of the elements in that document was that children should be encouraged to climb trees. A few members of the SF Forest Alliance spoke during public comment. They pointed out that the actual policies and practices of SF Rec & Park Dept contradict the document the Commission was being asked to endorse. The General Manager of course denied that such contradictions exist. Is he ignorant of signs such as these? One wonders. 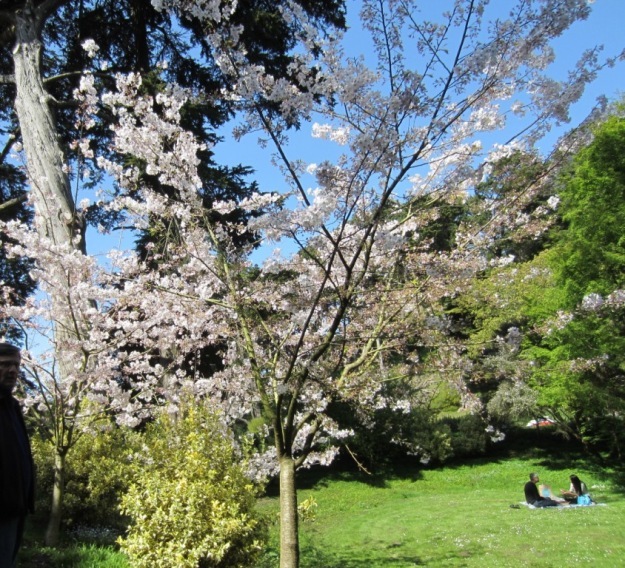 In regard to the parks and flora San Francisco has become the city of NO. Unless, that is, you own a tree trimming service with a chipper. Is it perhaps time to consider suing the City of San Francisco?